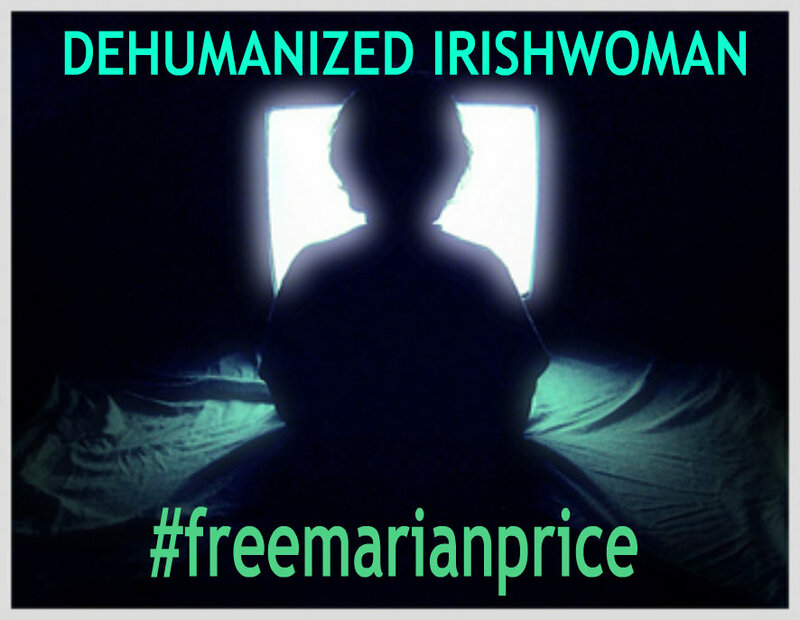 As a result of her internment of 18 months, more than a year in isolation, SD torture and 6 months of force feeding, Marian Price is now suffering from both physically and psychologically. After further deterioration in recent moths, Marianis currently in the City Hospital Belfast. She suffers from a number of psychological conditions as well several physical ailments including severe arthritis, a suppressed immune system and repeated infections.Now to compound this she has fluid in one lung.So Let your voice be heard in Dublin Nov 3rd. Assembly @ Garden of Remembrance, 2.00 pm and march to the iconic steps of the GPO ! of the political prisoners‘ torture, requiring concealment. The retreat of torture from respectability by international standards, means that the British must perform it in hiding, primarily with censorship. However they also conceal their involvement in rendition, as they hide their activity in subcontracted assassination, with more curtains over their already, shrouded victim's bodies. While their prolonged stress positions, as well as other conduct constituting cruel, inhuman, degrading treatment may not always rise to the level of torture, they nevertheless were found guilty of such, by the International Court of Human Rights in Strasbourg regarding their activity in Ireland. The physical erasure of British torture is self-evident, and therefore needs only brief comment. In secret courts, with identity blacked out on their transcripts, judges will not countenance torture complaints, they will have none of this conduct, deeming it unacceptable and defendants will receive a final warning, oblivious to international law. In such courts they do not want to hear the words, such international law again. The British are not concerned about international law, they will insist on it, by having someone like Marian Price removed from the hearings, so that their secret services and military can consider classified evidence against her in secret. British Occupied Ireland has been a laboratory, of their dehumanization, while they use their media, such as the BBC world srvice, to refer to prisoners of conscience, as terrorists, to ostracize them from what it means to be human and allow the British the physical and mental treatment of Irish political prisoners, abhorrent to human beings.Thus they accomplish through cultural erasure, through the creation of the terrorist narrative; legal erasure and physical erasure through torture. While the dimensions of dehumanization are distinct, they are interrelated. All are connected by law and specifically by human rights.The British have created the preconditions for state power activity, so brutal, as to deprive Irish political prisoners of the ability to be human or have any human rights.They stand exposed to the violence of the British state, unmediated, unprotected by any human rights, reducing political internees to a state of bare life without humanity. What is evolving is the Irish have no right, to have rights, a vacuum enabling extreme British state violence, placing the internment of Marian Price, at the center of a struggle not just for rights, but for humanity that includes you and me. Through resistance, political space will open but the mere resistance, the assertion of self against state violence, is self and life-affirming. Resistance is a way of staying human. This, then, is the work that rights do, when pushed to the brink of annihilation, they provide us with a rudimentary and perhaps inadequate tool to maintain our humanity. Thus by paying particular attention to the value of human rights and arguing the importance of rights, it becomes a mode of resistance, to state violence. Irish political prisoners themselves, have a long track record of participating in direct forms of resistance in many forms, including dirt strikes and hunger strikes, as a form of prisoner resistance, with lawyer rights-based litigation and the hunger strikes, sharing an understanding of the relationship between rights, violence, and humanity. While sometimes the resistance of lawyers and of prisoners may not be enough to win the prisoners‘ freedom, it is still essential when British state violence is so extreme, as to attempt to extinguish our humanity. Let your voice be heard in Dublin Nov 3rd. Assembly @ Garden of Remembrance, 2.00 pm and march to the iconic steps of the GPO !